30 PLAYERS, 30 HIT COINS. A new way to collect baseball players. Collectible copper coin featuring one of thirty baseball stars. Each star has been minted and presented on a baseball card-sized cardboard mount with the heads side featuring their portrait with name and position, while the tails notes a highlight from his career and carries an action pose. That small '1' you see under the Baseball Treasure logo indicates this coin was its first edition, first press. Baseball Treasure™ II coins will have their own unique identifier. Specially minted versions of the thirty baseball star coins cast in .999 fine silver. One in 216 packs of Baseball Treasure™ II will feature a special one-ounce silver coin. The pack also includes a unique cardboard mount designating you as a Silver Coin Winner. One in every 21,600 packs of Baseball Treasure™ First Edition includes a specially marked coin redeemable for a rare one-ounce solid gold coin of Aaron Judge commemorating his rookie record of 52 home runs last season. The pack also includes a unique cardboard mount designating you as a Gold Coin Winner. Baseball Treasure™ II features Mike Trout as its solid gold coin. One in every 18,000 packs of Baseball Treasure™ II includes a specially marked coin redeemable for a rare one-ounce solid gold coin of the super star. Baseball Treasure™ coins are collectible coins and not legal tender. 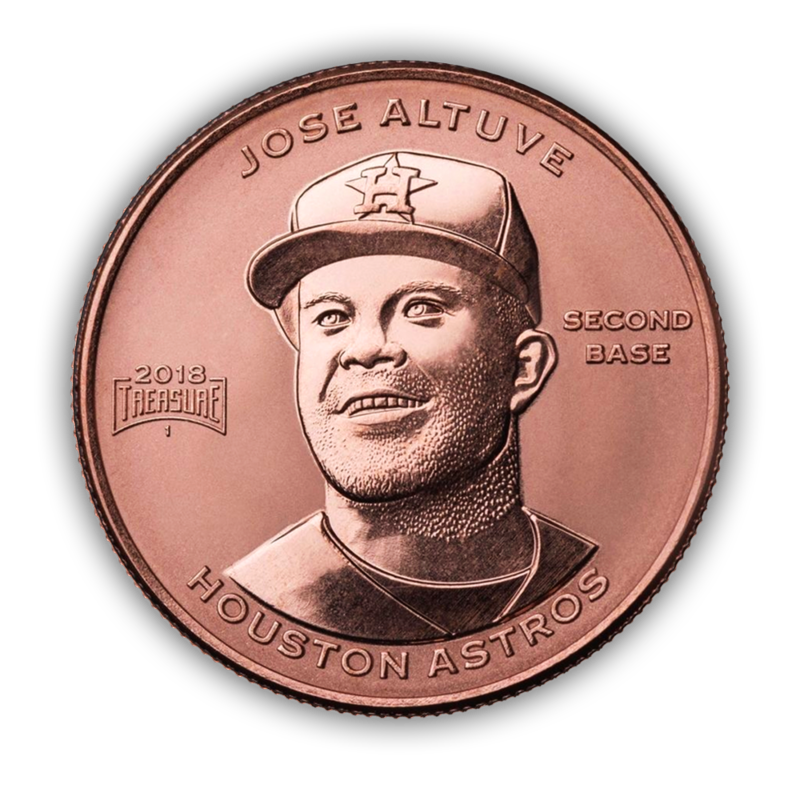 Copper and silver edition coins of Baseball Treasure’s™ First Edition include: José Altuve (Houston Astros™), Nolan Arenado (Colorado Rockies™), Josh Bell (Pittsburgh Pirates™), Adrián Beltré (Texas Rangers™), Mookie Betts (Boston Red Sox™), Justin Bour (Miami Marlins™), Miguel Cabrera (Detroit Tigers™), Robinson Canó (Seattle Mariners™), Michael Conforto (New York Mets™), Khris Davis (Oakland Athletics™), Corey Dickerson (Tampa Bay Rays™), Freddie Freeman (Atlanta Braves™), Paul Goldschmidt (Arizona Diamondbacks™), Bryce Harper (Washington Nationals™), Rhys Hoskins (Philadelphia Phillies™), Adam Jones (Baltimore Orioles™), Aaron Judge (New York Yankees™), Clayton Kershaw (Los Angeles Dodgers™), Francisco Lindor (Cleveland Indians™), Joe Mauer (Minnesota Twins™), Yadier Molina (St. Louis Cardinals™), Yoan Moncada (Chicago White Sox™), Wil Myers (San Diego Padres™), Salvador Pérez (Kansas City Royals™), Buster Posey (San Francisco Giants™), Anthony Rizzo (Chicago Cubs™), Travis Shaw (Milwaukee Brewers™), Marcus Stroman (Toronto Blue Jays™), Mike Trout (Angels™), Joey Votto (Cincinnati Reds™). Baseball Treasure™ II has added the following stars to its lineup. Ronald Acuna Jr. (Atlanta Braves™), Cody Bellinger (Los Angeles Dodgers™), Charlie Blackmon ( Colorado Rockies™), Alex Bregman (Houston Astros™), Kris Bryant (Chicago Cubs™), Jacob deGrom (New York Mets™), Shohei Ohtani (Angels™), Ichiro Suzuki (Seattle Mariners™), Blake Snell (Tampa Bay Rays™), Giancarlo Stanton (New York Yankees™), Christian Yelich (Milwaukee Brewers™).